Ladies. Gents. Children. Toddlers…it’s officially the start. The start of the holiday season. Are you one of those prepared holiday/early shopper people? I wish I was one of you. I am not. I’m the antithesis. I’m talking…tree finally goes up a week before Christmas. Gifts ordered two days before Christmas Eve. This, of course, leads to frantic calls to the post office. Passive aggressive conversations with Fedex. Paying a bit more in postage so holiday cards make it on time. Staying up late wrapping. STRESS! Holiday drama. Lots of it. I think part of me likes it…deep down inside I find it super entertaining. And also, I’m busy working. I dunno. I don’t have time to commit all this time to this holiday, man. So I wing it. Year after year. Invest in Amazon Prime. It gives you 2-day shipping FREE! No one said this was cheap. Prioritize what gifts are actually important and which ones you can get away with slacking off on. I know my dad likes books. I know he likes kitchen stuff. I can get alllll of that on Amazon. Why order it now when I can do it last minute? Business type cards and gifts. These are important. Now, my dad is important, too..even more important, actually; but he’ll forgive me if his present doesn’t show up. If I don’t send a business holiday card? Just not okay. Awful. There’s no room for error. Look at your holiday party invites. Sometimes parties get stressful–there’s just too many of them. Figure out which ones you can and want to bake for, and which ones you can get away with buying a bottle of wine for. I say ones that are total acquaintance type parties…a bottle of wine is perfect. It’s nice. Who cares if you picked it up at Trader Joe’s on the way over and only paid $5!! Seriously, no one cares. The parties thrown by your besties…those are the ones to cook and bake for. 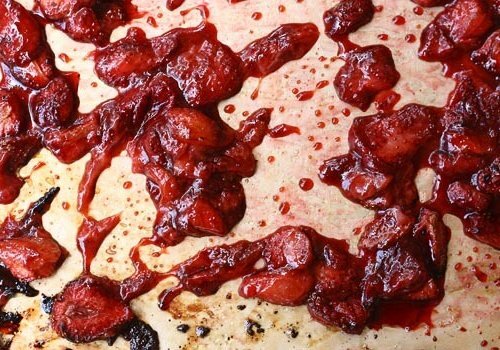 Cue this slightly tart (hello cranberries! ), perfectly textured (you’re cute rolled oats! ), moist banana bread creature. There are so many good things packed in this loaf pan. I say this recipe deserves to be doubled. Two loaves! They’re moist and delicious for FOREVER! Like 3-4 days…maybe even longer, but I wouldn’t know because it didn’t last that long. This means you can totally bake a few off on Saturday morning and keep them throughout the week, handing them out like Halloween candy. Also, say you don’t want to bake for anyone…because you don’t have time. Well, that’s cool…I say bake this for yourself then…eat it along side a cup of coffee and figure out your procrastination (or not) game plan. 1. Pre-heat oven to 325˚F. Lightly grease a 9×5-inch pan and dust with a tablespoon of flour. 2. In a medium bowl, mix together all-purpose flour, rolled oats, baking powder, baking soda and salt. 3. In a measuring cup, measure out the buttermilk. To the buttermilk, add the vegetable oil and vanilla extract and mix until combined. 4. 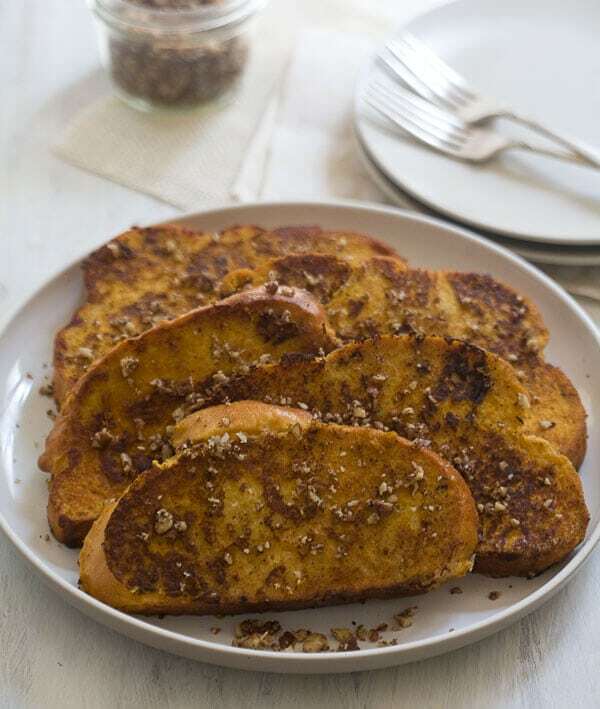 In a large bowl, using an electric mixer, beat eggs, light brown sugar and white sugar together until thick and pale, approximately 3-5 minutes. Mix in smashed banana and buttermilk mixture. In two batches, add flour mixture, mixing until just combined, being sure not to overmix. 5. 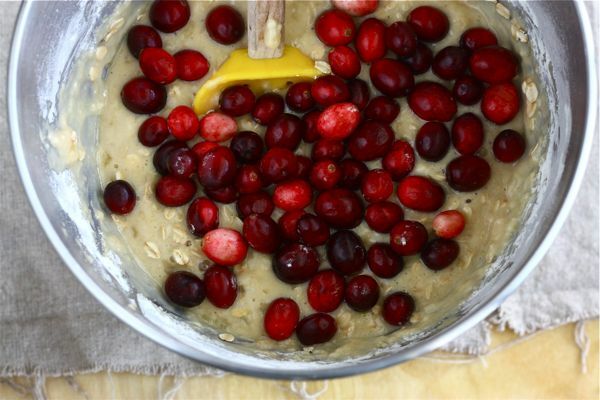 Fold in cranberries and transfer batter to prepared loaf pan. Top with a handful of rolled oats. 6. Bake quick bread for 1 hour, or until a tester inserted into the center comes out clean. Invert bread onto a rack to cool. 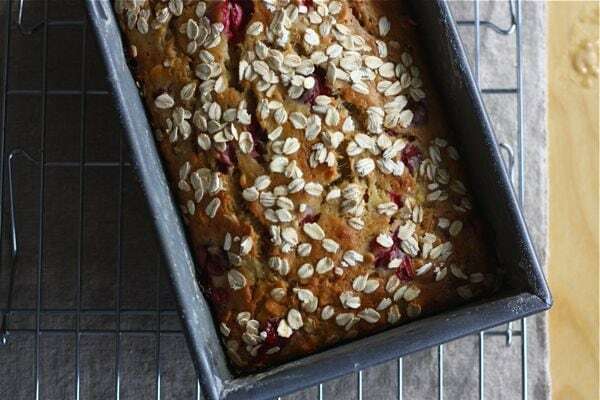 Cranberry Oatmeal Banana Bread will be moist up to 3-4 days. Wrap tightly in plastic wrap to preserve its freshness. i’m SO down with more cranberry recipes…i’m running out and still have too many cranberries in my fridge! I have to say, I just LOVE your blog! I feel like you’re really just chatting with me, which is a feeling that definitely works for me 😉 As for Christmas, we put our tree up about two weeks before the big day. That’s by design, though, because I like to leave it up for a bit into January! And I pretty much shop all year long… I find that I end up getting more thoughtful presents that way! Compliment of the day! Thank you thank you!! Perfect timing! I have two bags of fresh cranberries in my fridge and a couple of ripe bananas. I’ll have to bake two loafs because I want to keep one for me! I love your posts and photos! And I agree, Amazon Prime is awesome! I have a ton of leftover cranberries from Thanksgiving that I didn’t use….I know exactly what I will be making with them now! This bread is so delicious looking! Love it! YuMmY!!! And, I love the bright napkin you placed under the bred in the first photo. Where did you get it? 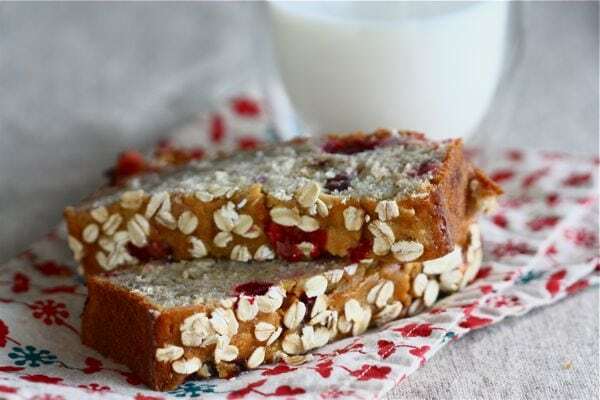 Ooo, I like the idea of cranberries cutting the sweetness of the banana in this bread. It looks so touchable with the oats sprinkled on top, too! 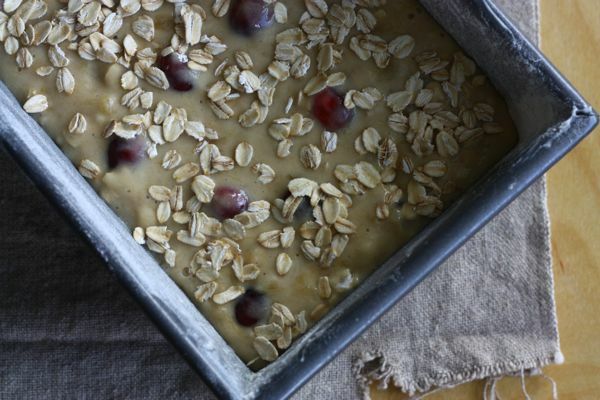 banana, cranberries, AND oatmeal…win! 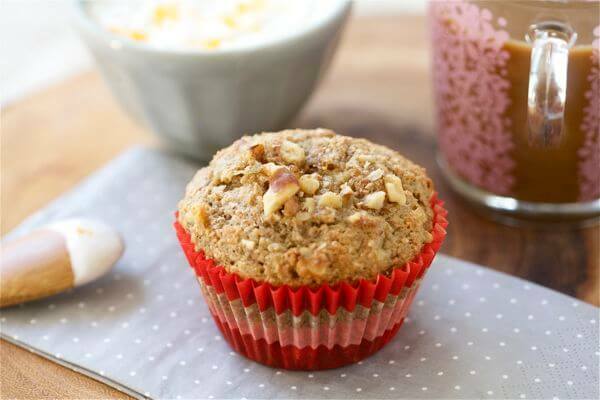 I just made pear cran muffins, but I think we might need this around the house next week….especially if it snows again, I need carb-fuel for that! I put up my tree already, but since I’m traveling for Christmas, I’m not shopping until I get to my destination…I don’t want to pay those baggage fees! this looks like a one of those recipes that looks like you put a lot of effort in but definitely doable say if you’re procrastinating haha. and i love all things bread. Also! I dont know if they are still doing this or not, but if you have a .edu email address Amazon Prime is free. Still enjoying the benefits of being a student even though I graduated last spring! yessss. Whoa I had no idea you could do this. I don’t think I have my college email anymore. 🙁 I wish I did! Two of my favorite ingredients! Very cool. This looks perfect for the overripe bananas on my countertop! yum! Banana Bread completes my life! The addition of cranberries – – well you’re just a smart cookie!! I get everything on Amazon! Last year, I bought all of my holiday gifts online and was like, this is brilliant! Why have I never done this before? Braving the mall is so unnecessary! Yay holidays. cute holiday quick bread tip: around the holidays, you can find cute little mini loaf pans at cookware stores, etc. (even better if you stock up at the after christmas sales!). Bake a bunch of mini loaves, wrap (still in the pans) in colored cellophane and tie with some ribbon or rafia. Cute and delicious! And I love amazon for christmas shopping–I hate Black Friday! Pro tip alert! You’re so right. I’m gonna put it up in the recipe. I usually prep for the holidays ahead of time but can I just say that you and my mom would get along swimmingly? she hasn’t started a tree or shopping… it will happen in about 2 weeks. Your mom and I are kindred spirits. mmmm i love bread. and cranberries. andbananasandoatmeal! yum yum ! Beautiful photos. It really gets me in the mood for Christmas. It’s all about the cranberries. Oooh Fresh cranberries in a banana bread?! I am soo into this. And you say it lasts deliciously for days? Alright, it’s decided, this is everybody’s Christmas gift this year. This bread sounds absolutely delicious! Do you think it would work with dried cranberries? I have a bag of Craisins begging to be used. I bet it would work lovely with dried cranberries! I was reading this and thought – what about pumpkin instead of banana? Weird or amazing? Hmm. Hmmmmmm… maybe I will just have to try it?! This bread looks so yummy!! I love your blog and all your amazing photo’s! This looks soo great, just my kinda bread! And I´m like you, not an early shopper person either, but what I do like, is to start baking early so I can enjoy cookies and other Christmasy-baked goods throughout all december! They taste better within Christmas, in my opinion! Amazon prime is the BEST! Oh, and your recipe looks pretty delicious too 🙂 I have been looking for a loaf-type recipe and this one has great flavors. I made this with blueberries instead of cranberries because that’s what I had on hand and it was wonderful! Can’t wait to make it with cranberries next! Blueberry Oat Banana Bread!! I dig it! I totally agree about Amazon Prime. Never thought twice about it. Golden. I am loving this bread. It’s simply beautiful. I tend to want to be a “Martha” but life gets in the way. I’m also one of those list makers, spend tons of time making them perfect, then forget them at home. Lol! Just pulled this loaf from the oven. Fighting the temptation of cutting in too early. While I wait, I’ll tell you my story… I follow your tweets. I think i picked you up from an LA/or NY Times re-tweet? This loaf jumped out at me when you tweeted it, I’m a big fan of banana. Later that evening my wife was oohing and aah-hing over an Ocean Spray commercial, bragging about their bodacious bogs. This seemed like destiny. Cranberry shopping ensued. I have to agree. Well Done Adrianna! Refreshing change from plain old banana bread! HAHAH! That’s awesome. You have no idea how happy this makes me. No idea. P.S. I made this when I was back home days after Thanksgiving and my dad ate the entire thing in three days. If you wrap it correctly it lasts for FOREVER. Would dry cranberries like craisins work or do they need to be fresh for it to taste ok? Dried cranberries would totally work! I made this last night after finding you on tastespotting.com. It has to be one of the prettiest loaves of bread I’ve ever made! But a question for you on the cranberries… I usually sweeten them (boil with sugar, or at least coat in sugar) before I bake with them. I found the cranberries to be a little wickedly tart without sugar (like I almost can’t eat it!). Is that the nature of the recipe, or do you think I had a bad batch of cranberries? Or perhaps I just used too many? I found this on Foodgawker when I was searching for a recipe using bananas and oats as I was looking for something to do with the three blackened bananas sitting on the table and the over abundance of oatmeal purchased for daughter’s winter breakfasts. The photos were so appetizing, I just had to give it a try. My buttermilk had turned chunky ( and it was only two months expired, go figure?! ), so I substituted a like amount of Greek yogurt. I misread the recipe and used the right amount of cranberries, only I used dried instead of fresh. I put the bananas in the Kitchen Aid to smash them and turned them into banana purée instead. I just added the eggs, etc to the bananas and went on from there. With all of these mistakes, it would be understandable if this turned out like a brick. It didn’t, though. This was the most divine quick bread I have ever made. The banana purée made the bread extra moist and the dried cranberries soaked up the moisture and plumped right up. You would never know that the berries had started out dry they were so moist. And pretty – Wow! Each slice was just right, with cranberries sprinkled throughout. I do think next time (read- as soon as I can find some more overripe bananas) I will cut the brown sugar back just a bit. But only if the bananas are really overripe, again, and I make them into purée rather than smashed. Thanks for the great recipe. We enjoyed it a lot and will continue to enjoy it for years to come. HAHAHA! This is so awesome. So good to know that this recipe is foolproof. Glad it worked out despite all that. LOVE IT! This looks great. I have a huge bag of dried cranberries I need to use, could I use those instead of fresh? Yes, it’s an easy swap-out. i made this last night but the cranberries made it so sour!!! has this happened to anybody that made this?? Hmm…I mean cranberries are sour/tart so it maybe that you just don’t like them? 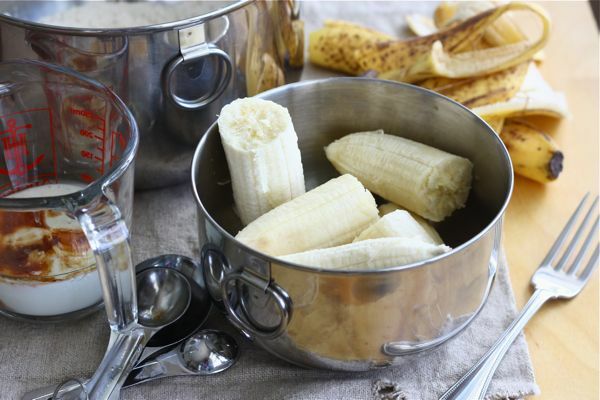 The bananas and sugar definitely give it a sweet element to balance out the tartness. The only thing I can think of is that your buttermilk was a bit too old. Sorry you had trouble with this! I made this with a couple of slight substitutions. I used whole wheat all purpose flour, and added a cup of walnuts. I had to bake it about 15 minutes additionally – possible due to these? Anyway, I loved it, but yes, there were some real bursts of sour with the cranberries – but I liked that. Might not work with children, though. If you want to avoid this, I think it would help to rough chop the cranberries first. Then the sour taste is more distributed. You could also add a bit more sugar – but not the healthiest alternative. All in all, loved the recipe and will make it again! Thank you! I made this and baked it a tad too long so it was dry. I made it again a few days later and used blueberries instead of cranberries, it was DIVINE. I love your recipe! Oh! I’m so glad it ended up working out. YAY!